An old seminary, a hiking trail, and a terrible pair of shoes. This post was originally published on Medium in July. It was 84 degrees and clear skies all around as we made our way to Saint Edward State Park. 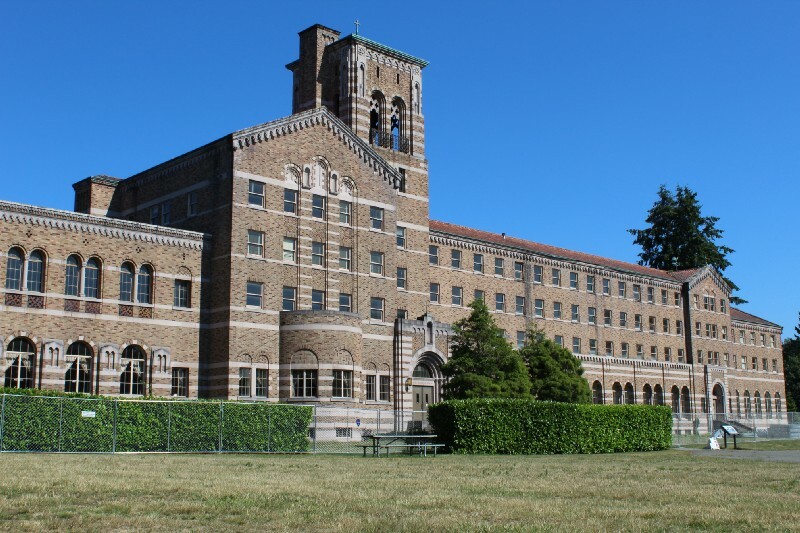 Located in Kenmore, Washington, the park is named after the long-closed seminary that was built next to Lake Washington in 1931. I enter the gravel parking lot, driving slow as I look for the kiosk where we can pay for parking. We find it and my boyfriend gets out to pay while I pull into a nearby spot. For several years now you’ve had to pay to go to any of Washington’s state parks, something that has kept me from exploring more of them until now. 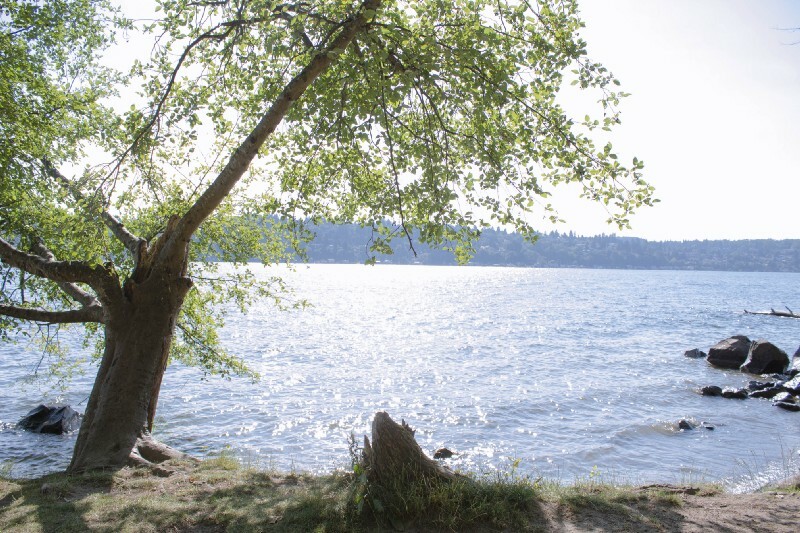 But my boyfriend and I have decided we want to try and visit all twelve state parks in King County, where we live, before the summer is over. So we’re paying the thirty dollars to get a Discover Pass, which will give us access to all of the state parks for the next year. As I get out of the car my boyfriend returns with the printed receipt meant to go on my dash. I guess I’m supposed to keep it for the next year, but it’s pretty small and the kind of thing someone like my could easily lose. We unload the car of our things –our lunch, my camera, two towels — and start looking for a shady spot to sit and eat. Walking across the grass, the first thing we see, dominating our view, is the seminary that gives the park its name. 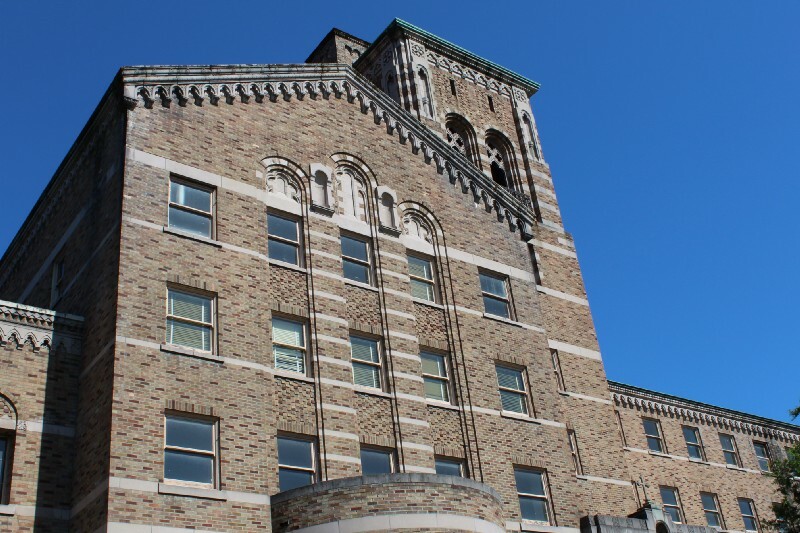 The idea of building the seminary came from Edward O’Shea, who was Seattle’s first bishop. The architect John Graham designed the building, which would become the first fully-accredited seminary in the US. It served as an educational institute from 1931 to 1976. A year after it closed it was purchased by the State Parks. Today, the building is surrounded by a chain link fence. You can’t get up close to it and peak in the windows, the way I was hoping to be able to. Instead, we eat our lunch and when we are finished we walk around the perimeter of the building and I take pictures from a distance. The fence is up because the building is about to undergo construction. Since closing, the building has fallen into disrepair. Lacking the budget to fix it up, the state made a deal with a real estate company to turn it into a hotel and restaurant. This seems like a shame to me. It’s a lovely building and a peaceful park. I find it hard to believe that it will retain its charm after the renovations are complete, or that the park will remain the peaceful place it is once this historic monument becomes a resort. And I’m not the only one. According to an article in the Seattle Times from last year, many people are unhappy with the change, even starting an online petition in an attempt to stop the proposed hotel plans from moving forward. But the petition was unsuccessful, and the plan is going ahead. How the new hotel and restaurant affects the surrounding area remains to be seen. Maybe it’s a sign of my lack of financial understanding that I don’t quite get how there can’t be enough money to go around in our state’s budget to take care of our historic monuments without selling them out. 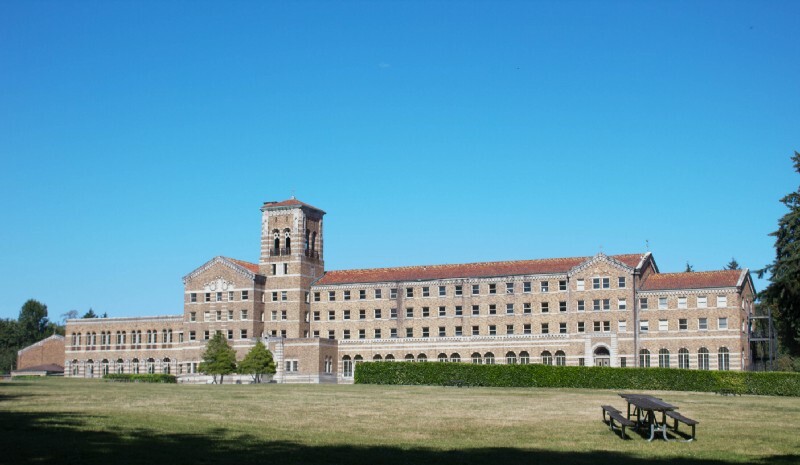 What with the pricey cost of admission to the state parks and the various new taxes that get added each year, it seems to me there should be a way to preserve the seminary in a way that provides benefit to all, instead of just the few who will be able to afford the undoubtedly pricey rooms and restaurant. Moving on from the seminary, we make our way down a short path to an area known as The Grotto. 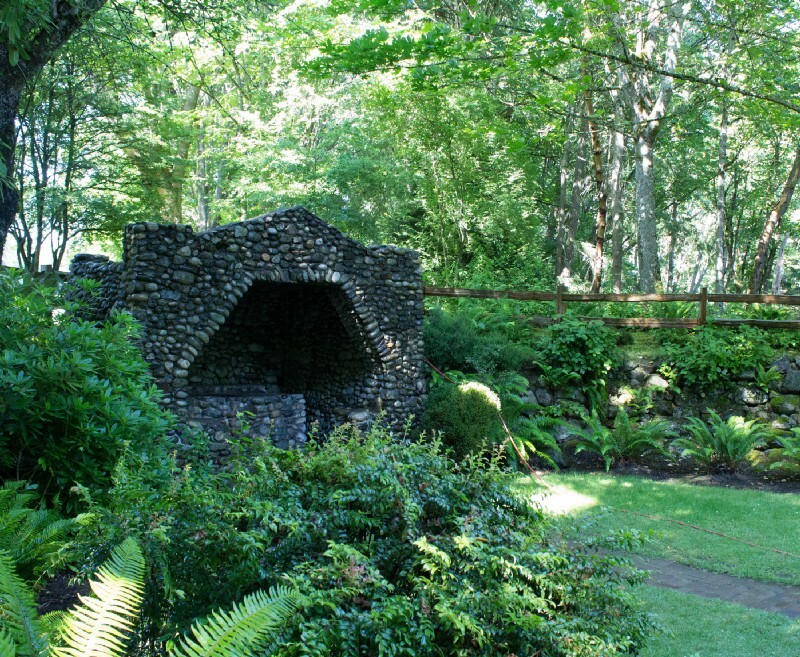 The Grotto is a small stone structure that was originally built as a spot for the priests to pray. Somewhat secluded among the trees, it is now available to explore on your trip to the park or to rent out for weddings and other events. 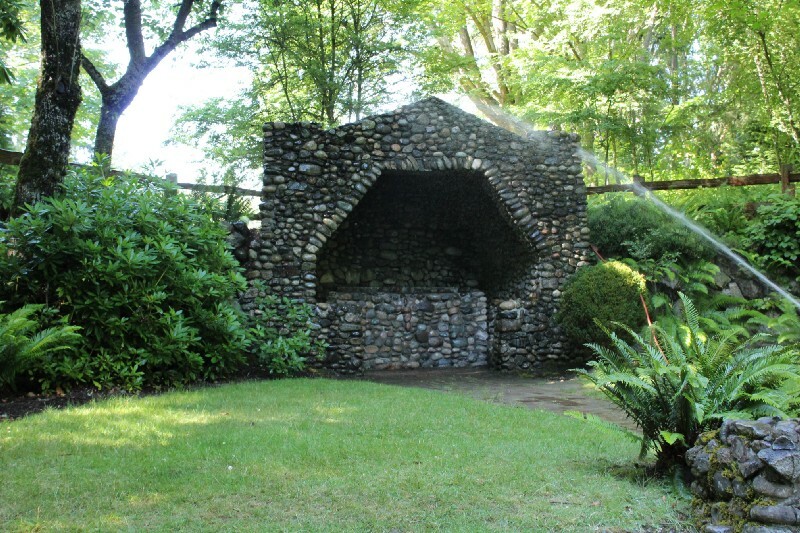 When I got there, a large sprinkler was on in the middle of the enclosed area where The Grotto it, shooting off a twenty-foot stream of water in a circle. This made my plan of taking photos a little bit more difficult, but I followed the streaming of water as it went around, trying to avoid the spray, and still managed to get a few shots. From there we took the Beach Trail leading down to, you guessed it, the beach. The trail was less than a mile downhill, and wasn’t too difficult to navigate. Or it wouldn’t have been if I had worn the right shoes. I didn’t realize how far the waterfront was from the entrance to the park before we got there, and I stupidly wore a pair of sandals that were definitely not made for even the gentlest of hikes. But once we made it to the beach, I felt like my aching feet were worth it. The sun sparkled off the water and the surrounding trees gave the area a feeling of peaceful seclusion. If we had wanted to, we could have followed the trail on a hike all the way along the waterfront, but my feet weren’t having any of that. Instead, we found an area to lay out our towels and relaxed in the shade. We didn’t bring any swim gear, but we sat near the water and dipped our toes in. We watched boats sail by and imagined what it would be like to be out on the water ourselves. Once we had our fill of the beach, we made our way back up the trail the way we came. And while the hike to the beach was manageable even in my inappropriate footwear, the walk back was a different story. That easy downhill walk became a demanding challenge when I had to do it again uphill, my feet vowing revenge with every step. I’m also not the most physically fit person in the world, so, unfortunately, my boyfriend had to put up with no small amount of whining and frequent breaks on the way up. It was also hot that day, and the heat was making me more cranky. By the time we got back to the car, I felt half-dead. Maybe this is why I don’t go outside more often. Despite my exhaustion and general wimpiness, I would definitely recommend visiting Saint Edward State Park if you get the chance. It’s beautiful, peaceful, and the seminary building is an interesting piece of architecture worth seeing, if you enjoy looking at old buildings like I do. This is just one of the many state parks that Washington State has to offer, and I’m excited to explore more of them in the near future. Do you like going to state parks? Do you have a favorite one? It looks like an absolutely gorgeous park, such a shame about the building though! It’s a very pretty park! I agree it is a shame. I guess we’ll just have to wait and see how it all turns out. Thank you for reading!